By now, Robert Khan and Tom Salinsky have cemented themselves as great historical Doctor Who writers. The penned The Ravelli Conspiracy and Kingdom of Lies as well as some titles for other ranges or upcoming adventures for the next year. Both The Ravelli Conspiracy and Kingdom of Lies went down very well and I have a feeling that Entanglement will be held in the same regard. This series of Early Adventures has had a lot of fun throwing twists and turns at us listeners so we are never quite sure what is going to happen. And Khan and Salinsky continue that trend, just when we think we know what is going on, a new character will turn up or something will happen that will wrongfoot us again and make us think once more. For a large part, the story works because of that. For another part, the story works because its the First Doctor, Vicki and Steven wandering around a college in Cambridge! Khan and Salinsky have also shown us that they have an uncanny ability to craft and create some cracking First Doctor stories. Anyone can write a good First Doctor story but this pairing seems to be able to create the unique feel that that era of the show had. And it is very easy to hear William Hartnell delivering the lines they have written. The pair has a great handle on Vicki and Steven too, giving the pair plenty to do within this story. They make the right choice of separating Vicki and Steven quite early on to give each character an adventure all of their own but how and why the characters are separated is one of many great moments that this story has to offer. 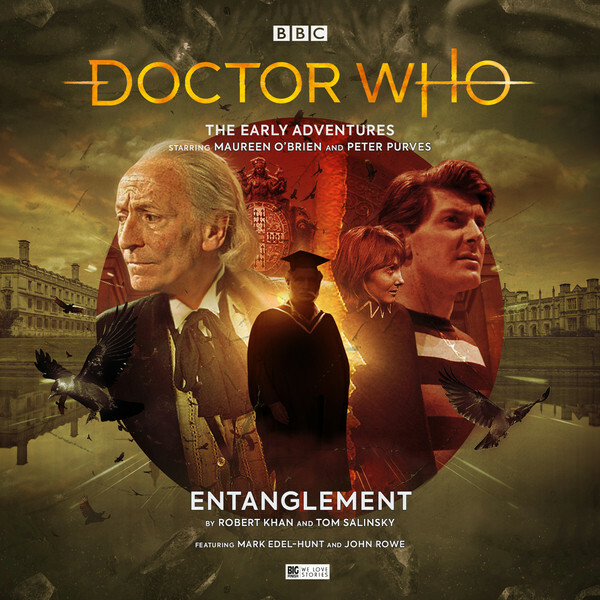 While some of the twists and turns, as well as some of the moments, were a little too predictable for me to enjoy them thoroughly, Entanglement is another truimph from Khan and Salinsky and I hope to see that they will write more First Doctor stories in the years to come. Surviving actors, Maureen O’Brien and Peter Purves both do a terrific job with this script, the pair obviously enjoying how clever the prose actually is. As I said above, it is a story where you think you understand what is going on and then a curveball is thrown in and the whole thing gets shaken up again. O’Brien and Purves clearly enjoyed that aspect of the script too. Purves is on hand as the Narrator as well as his character Steven and the Doctor. I’ve said many times in the reviews for these Early Adventures that he is a great presence in these stories and his ability to tell a story makes for an incredible listen. His impersination of William Hartnell’s First Doctor might not be pitch perfect, it can be a little too high pitched at times, does capture the spirit of the original performance. And even though it is Purves reading those lines, it is hard to imagine anyone other than Hartnell delivering them. Purves is also excellent as Steven and Khan and Salinsky make sure he gets plenty to do here. From hurling stones at the TARDIS to helping stop the villian at the end, Steven isn’t left out of the action. While he might be an underrated companion on screen, Purves has found his place as Steven on audio, no doubt to the strange abilities of everyone at Big Finish to give the characters some much needed development. I hope this continues and so long as Purves continues to work with Big Finish, I and my wallet, will be reading to buy whatever they throw at me! Like Purves, Maureen O’Brien is another terrific addition to this story. She was another underrated companion on screen but here on audio, she too has really found her place, solidifying my belief that was a companion who didn’t get much development. O’Brien really steps up to the plate with every audio adventure she is in and there is no sign of her getting bored of this anytime soon. She is also excellent as the narrator, really selling the story to the audience. She is a magnificant edition to the world of Doctor Who and Big Finish. I hope she too continues to work with them for a long time to come. The guest cast do a great job too. Mark Edel-Hunt, Sam Woolf, Philip Fox, Richard Braine and John Rowe all do tremendous jobs with their respective characters. Some of which you’ll love, others you’ll know their characters up to something dodgy. But not one of them falls into the trap of overplaying their roles. It is also a testiment to Lisa Bowerman who can gather a terrific cast and bring this brilliant script to life. She instinctively knows what makes a good, not only Doctor Who story, but a story in general. She doesn’t let the ball drop with the pacing which stays steady all the way through and she gets the best of the script out through the tight direction and her work with the cast. Overall, Entaglement is another successful entry into The Early Adventures range. While the last story, An Ideal World didn’t really set my imagination off, Entaglement worked tremendously well, thanks to its tremendous direction, fantastic cast both main and guest and another solid script from Robert Khan and Tom Salinsky. I hope they come back to do more work with Big Finish soon! Maureen O’Brien (Vicki / Narrator), Peter Purves (Steven Taylor / The Doctor / Narrator), Mark Edel-Hunt (Guy), Sam Woolf (Kim), Philip Fox (Professor Charles Lewis), Richard Braine (Professor Linus Woolf), John Rowe (Sir Isiah Hardy). Other parts played by members of the cast.